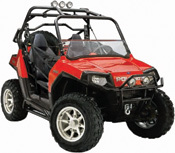 One toy "screams down the trails" and "tackles mud, rocks, and anything else nature throws its way." The other "dances over everything from muddy single track to boulder fields." With their grippy rubber treads and bomber construction, both may sound like fun to outdoorsy gearheads of all stripes. But the difference between the two underscores the fierce, slow-motion battle under way over how people play on the West's public lands. The first toy is a four-foot-wide offroad vehicle. 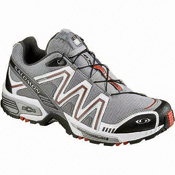 The second is a trail running shoe. 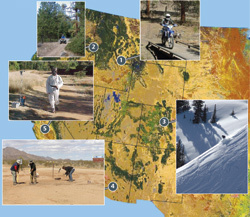 By 2009, the Forest Service expects every national forest to have an updated plan to manage motorized recreation (11.5 million visits to national forests each year involve off-road vehicle use, and the number of off-road vehicles sold per year has tripled since 1995), close bandit trails, and reduce conflicts between the hikers, bikers, horseback riders and motorheads currently clogging the same paths. In many places, the public process has been fraught with bitter divisions, endless meetings and delays. Only 17 Western forests out of nearly 100 have completed maps showing where off-road vehicles are and aren't allowed to roam. The rest, from Utah's Dixie to California's Inyo, are still chugging away. The Bureau of Land Management is grinding through a similar effort. "These are passionate people. They get loud," White River National Forest planner Wendy Haskins says, speaking of public meetings on the Colorado forest's developing plans. And whatever balance land managers strike isn't likely to please everybody. "There's a limited amount of land out there, and everybody wants a piece of it," says Bitterroot National Forest planner Dan Ritter of Montana. But regardless of what they decide, agencies may ultimately be hard-pressed to make folks observe new closures and rules. The Forest Service's 2009 budget proposes a $16.5 million cut in law enforcement. The BLM faces a similar plight, with about one agent available for every 1.2 million acres of land. The key will be collaborating with local governments and recreation groups on policing and educating users, says Haskins, provided they're willing.